While it’s probably true that all museums could use a little extra money to run, it’s probably not as dire as the museum scene in Indonesia, where the museums in Jakarta are facing serious problems in their administration, from poor displays to the inability to hold public programmes and even basic security. Strolling around the National Museum in Central Jakarta, arguably the most complete ethnographical and archeological collection in the country, visitors notice that objects are not well displayed; antique statues are uncovered and English translations are poor. On the fourth floor of the new wing, a huge translation in an expensive golden brown frame explains about the museums ceramics, in very poor English. 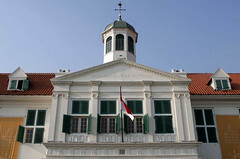 As it is administered by the Ministry of Culture and Tourism, the National Museum offers various programs over the year, including art performances, seminars, competitions, and exhibitions. However, these programs are poorly promoted.